Hello!! Happy Monday! Another weekend has come and gone and all too quickly i must add. This weekend was very productive for me though. All day Sunday i was lucky enough to have a crafting day with my momma and was able to get a lot of cards done and try some techniques that i have been dying to try!! It was such a great day!!! Today's card is just a simple card that i made using my clear blocks, some ink and the Bloomin' Marvelous stamp set that is available right now with SAB. Don't miss out on SAB, there are some great items that you can get for FREE for every $50 you spend (before s/h and tax). Click HERE to see the SAB brochure. 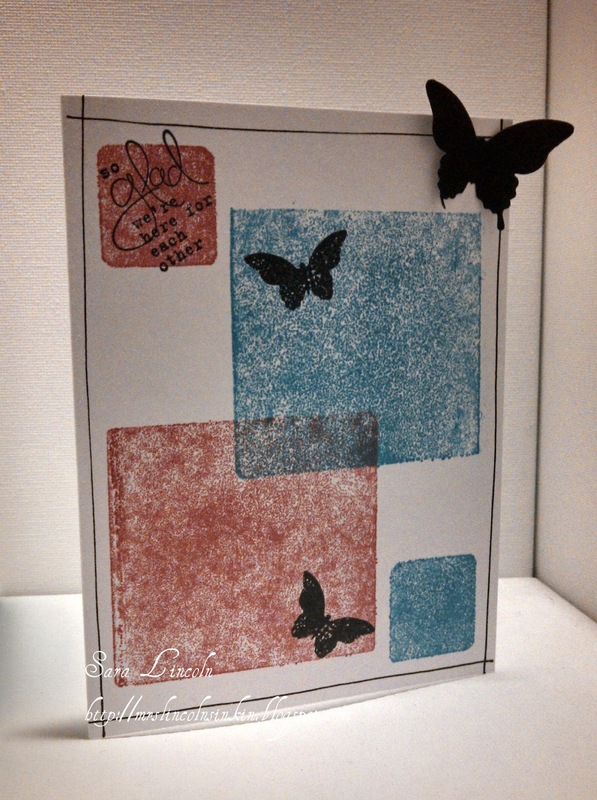 For the card above, what i did, was i took my Block D and my Block A, placed them right in my ink that i chose, Primrose Petals and Tempting Turquoise and then placed... or stamped, lol them on my card, which gave me the Squares! I think it's a great way to make a simple card or some simple homemade DSP. And we all know how much i LOVE homemade DSP!!!!! !